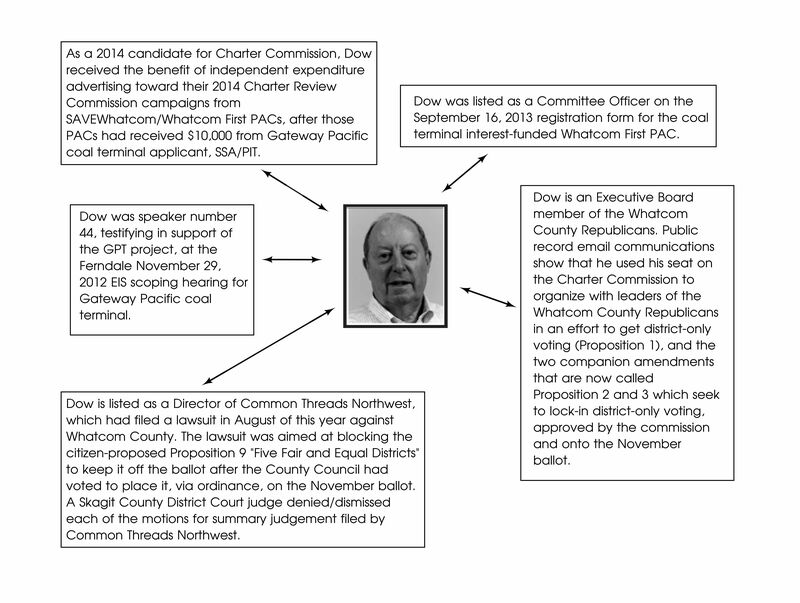 It is evident from reviewing public record email communications, that Gateway Pacific Terminal consultant Dave Brumbaugh, advised Whatcom County Charter Review Commissioner Chet Dow and others on strategies aimed at getting district-only voting approved by voters of Whatcom County. One of those emails is shown in the screenshot photo. Commissioner Dow proposed Charter Amendment 10 [now called Proposition 3] which seeks to lock-in Proposition 1 district-only voting if it were to somehow be approved by voters in the Nov. election. 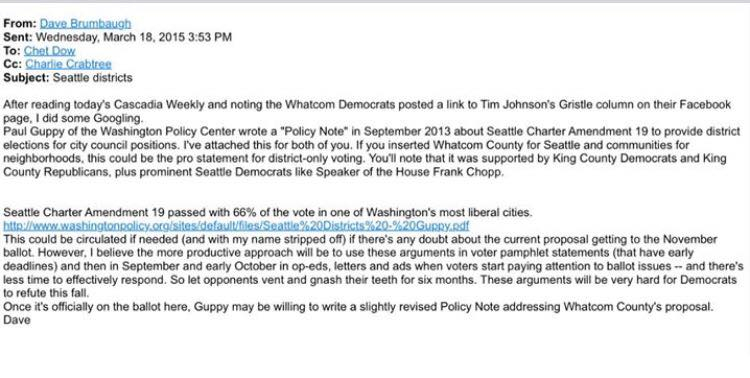 Two days after the conservative majority of the Charter Review Commission passed Amendment 1 district-only voting (now called Proposition 1), Commissioner Chet Dow sent a February 25, 2015 email to Roger Almskaar. In the email, after referring to the February 23rd Charter commission meeting at which the conservative majority of the commission passed Amendment 1 district-only voting (now Proposition 1), Dow told Almskaar the commission’s “job was only half done,” in terms of restoring district-only voting (what he termed “fair representation”). While it is clear that it was/is Commissioner Dow’s intention to attempt to prohibit the County Council from proposing any charter amendment pertaining to the method of nominating and electing County Council members, it is important to clarify that his characterization of the Council’s power is incorrect. In his email, Dow said the Council’s power to “overturn” the will of the people. The County Council does not have the power to “overturn” the will (the vote) of the people. The Council only has the power to place, via ordinance, a charter amendment on the ballot for a vote by the people. So, Dow and the conservative commissioners who approved Amendment 10 [now called Prop 3] are trying to severely handicap the will of the people by severely limiting the powers of the County Council. In his email referenced above, Dow called his proposed Charter Amendment 10 (now called Proposition 3) a “companion amendment” which he said addresses section 8.23. (Prop 1) for a long, long time. This entry was posted in Commentary, Facebook Post, Information and tagged Chet Dow, Coal, Dave Brumbaugh, Gateway Pacific Terminal, November 2015 Election, Politics, Whatcom County, Whatcom County Charter Amendments, Whatcom County Charter Review Commission. Bookmark the permalink.